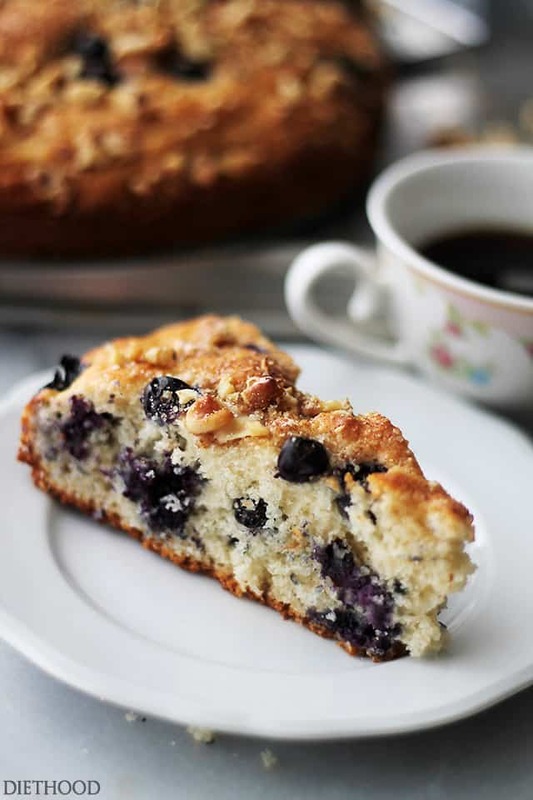 Lightened-Up Blueberry Coffee Cake – Soft, light and airy, this coffee cake is loaded with fresh blueberries and topped with sweet, crunchy walnuts. Low calorie, but it sure doesn’t taste like it! It’s absolutely delicious! Say HELLO to my favorite breakfast/brunch sweet comfort food! 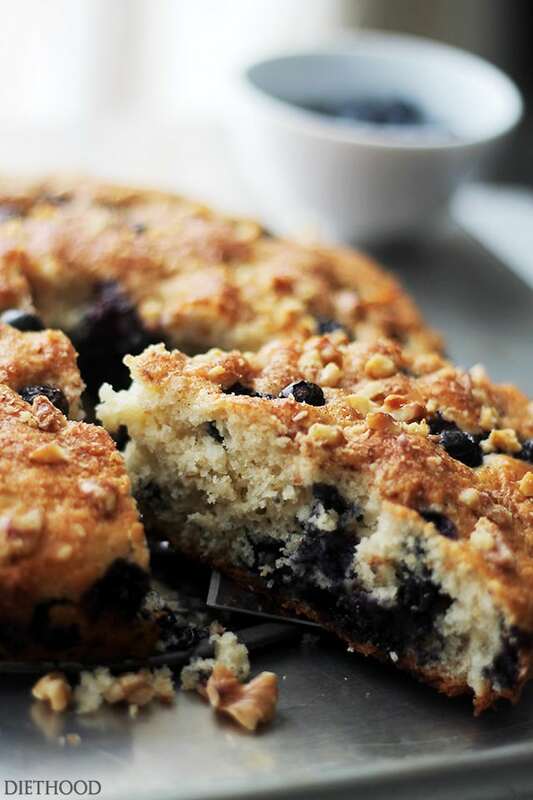 Throughout this post, instead of “Blueberry Coffee Cake”, auto-correct kept on changing it to, “Beautiful Coffee Cake”… Even auto-correct knows what’s UP! HI HEY! What’s going on, pretty friends?? It’s the weekend! Hooray! It’s apparent that just like Friends reruns, Three’s Company reruns AND Everybody Loves Raymond reruns, I cannot get enough of cakes. I am straight-up infatuated with them. I even have a whole Pinterest Board dedicated to just Cakes. They’re SO pretty! 1 layer, 10 layer, lemon cake, chocolate cake, coffee cake… I don’t discriminate, I love ’em all! BUT, since I’m a coffee fiend, coffee-cakes and I hang out together quite often. 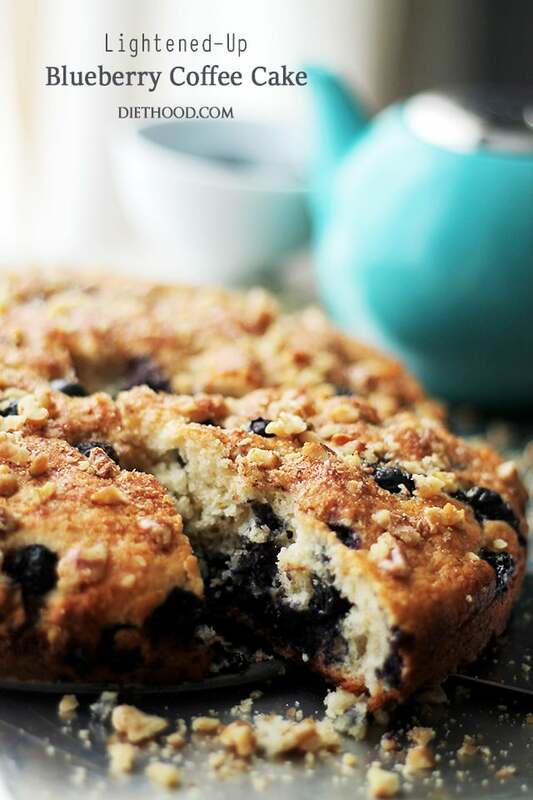 So it’s only appropriate that I dedicate an entire post to my all-time favorite, super adaptable, absolutely and totally delicious Lightened-Up Blueberry Coffee Cake. Couple years back I ran across the recipe for this particular cake and I have been making it ever since. I honestly have a hard time NOT making it every weekend. If something seems to be lacking in my life, this cake just magically pops into my mind, like, heeeey, pal! Make me and things will be well again! Then I answer back, like, Ummm…OKAY! And oooo-ey, things really ARE great again! The other beauty of this cake is that it’s really flexible and totally customizable. However, what you really need to remember is that it’s only 220 calories per slice. If you cut it as thin as I do, it can be 150 calories per slice. Which will leave enough room for an Omelette Wrap beforehand. Just sayin’. 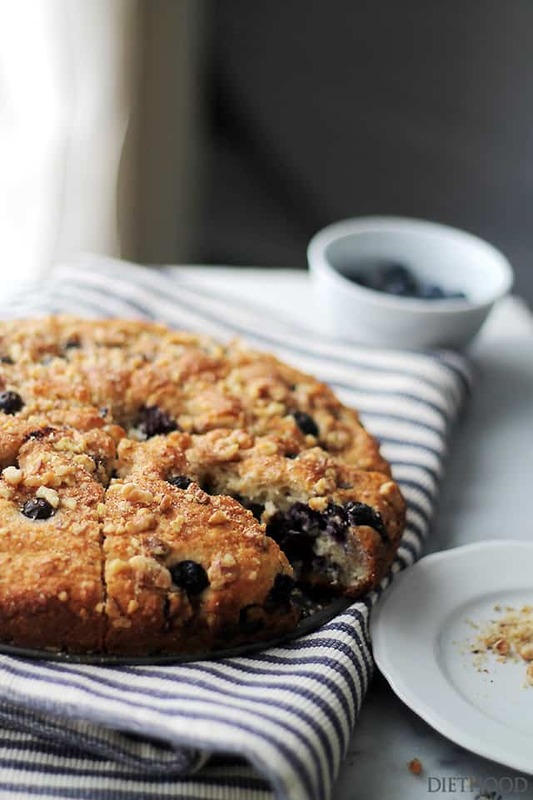 Soft, light and airy, this coffee cake is loaded with fresh blueberries and topped with sweet, crunchy walnuts. Lightly grease a 9-inch springform pan with cooking spray and set aside. In a medium mixing bowl, whisk together flour, sugar, baking powder and salt; set aside. In a large mixing bowl, combine egg, almondmilk, yogurt and vegetable oil; whisk until thoroughly incorporated. Using a spoon, stir flour mixture into egg mixture; stir just until combined. Set aside. Toss 1 cup of blueberries with 1 tablespoon flour. 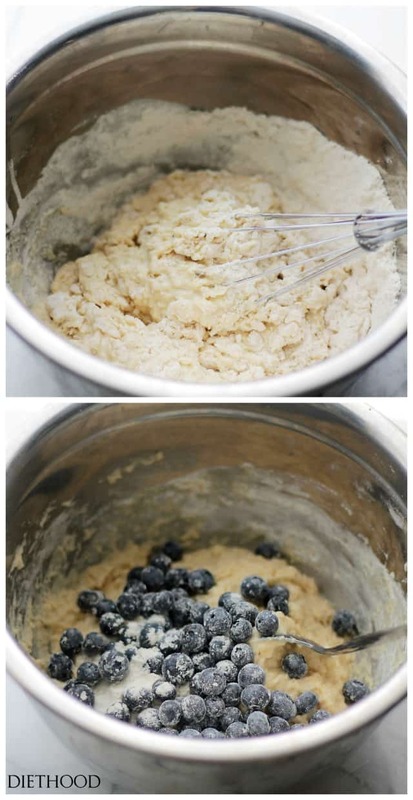 Gently fold blueberries into prepared cake batter, trying not to break up the fruit. Pour into previously prepared cake pan. Top with remaining blueberries and walnuts. Sprinkle top of cake with turbinado sugar and cinnamon. Bake for 22 to 25 minutes, or until a toothpick inserted in the center of the cake comes out clean. Remove from oven and transfer to a wire rack; let stand in cake pan for 10 minutes. Remove sides of springform pan and let completely cool. Have you made this with almond flour? And if so, what adjustments would I have to make? Hi Jennifer! So sorry for the delayed response; I am just seeing your question. So a 9 inch springform pan makes about 10 cups, whereas a 9 x 13 pan makes 15 cups. I haven’t tried making this cake in a 9 x 13 so I can’t say for certain, but according to the math, you would have to add one-half of everything. 2-1/2 cups flour, 2 cups milk, etc… Again, I don’t know for sure if this would work because I’ve never done it, but it might be worth a try. I hope this helps. Can you substitute greek yogurt? Do you think that will change the taste significantly? Hi! You definitely can’t taste the yogurt in the cake, but I think that Greek yogurt is a little more sour so it might add a bit to the taste and make it tangier. I made this for breakfast and loved it! I made a few subs in case anyone is interested. I subbed oat flour for 1/2 the flour, used frozen thawed blueberries, and used stevia in place of the white sugar. Definitely a repeat breakfast!!!! Have you tried making this with whole wheat flour? Do you think it would work? Thanks! Hi Alison! I have not made it with whole wheat flour, but if I was going to, I’d only use 1 cup whole wheat and the other 1 cup would be all-purpose flour. I hope this helps! I am going to try this recipe, it looks delicious. 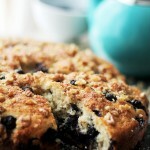 Blueberries and coffee cake are two of my favorite things! I can’t believe this is low cal. 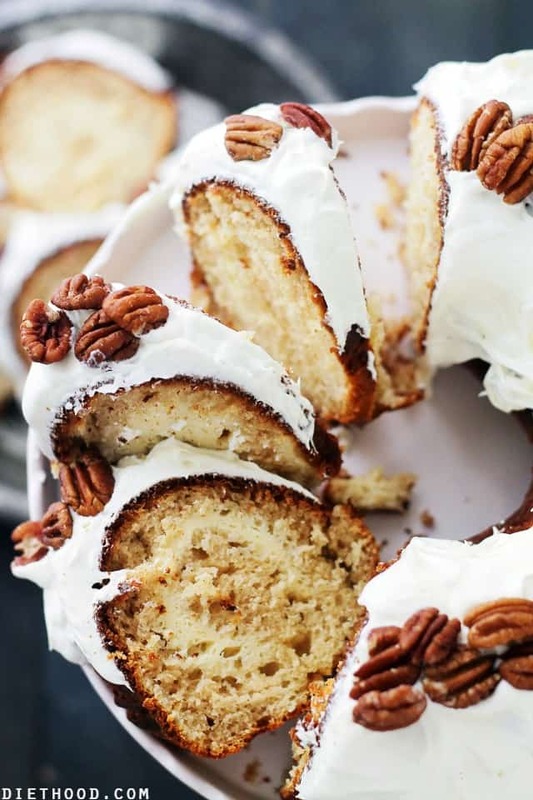 Oh, and doesn’t everyone have a Pinterest board dedicated to cakes. I thought that was totally normal. Is it the vanilla almond milk? I know what I’m making for breakfast this next week. This looks so delicious and I love that it is a healthier version. Thanks so much for the recipe!! Have a great weekend!! I have a hard time not making coffee cake every weekend too. This one look super yummy. I love the addition of blueberries. 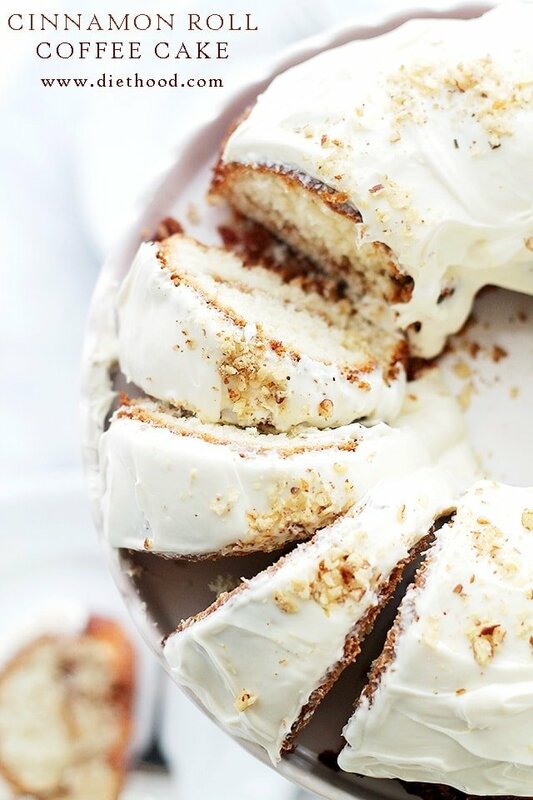 I basically just want to spend the day cozied up to this coffee cake, you’ve done it again!! This looks so tempting… Can it be made with Splenda instead of the white sugar? Hi Carmela! Yes, it actually can! I have made it with splenda for my dad and it worked out beautifully. I hope you get a chance to try it. Thank you! !